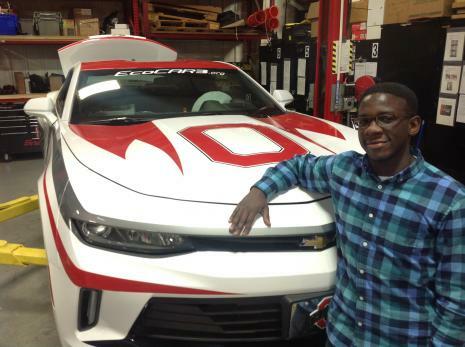 Dennis Kibalama poses with a car at Ohio State’s Center for Automotive Research. Credit: Courtesy of OSU. An Ohio State engineering student is striving to create a brighter future for his home country by helping develop Uganda’s first car manufacturing plant. Dennis Kibalama, a second-year graduate student in electrical and computer engineering, is working on clean energy vehicle projects for Ugandan startup Kiira Motors Corporation. Established in 2014, KMC is taking part in a presidential economic initiative in Uganda, Vision 2040, which aims to transform the country to a middle-income country by that year. KMC is set to start production in 2018, attempting to produce about 60,000 cars and create more than 2,000 jobs in Uganda each year. KMC is designed the first manufacturer for electric vehicles, hybrid vehicles and solar-powered busses not only in Uganda, but also Africa as a whole. KMC’s product line will include pickup trucks, SUVs, sedans and buses. Kibalama said KMC is not only a car-production company, but also a mechanism to connect the Ugandan government with the people to stimulate domestic demand and boost the local economy. The Kiira Motors Corporation developed from the Kiira EV, a student-based vehicle design project. Kibalama joined the Kiira EV as an undergraduate in Uganda. He then came to OSU, where he found the opportunity to work with OSU’s Center for Automotive Research on the EcoCAR program, a national green technology competition. Kibalama said he is looking forward to taking what he’s learned at OSU and applying it in Uganda. “Even though (KMC) is not in production right now, 10 years down the road there will be something that you are researching right now that needs to be applied in the future,” Kibalama said.